Honestly, I have no idea how I’ve only just managed to discover the big wide world of baking for one using a mug. And I have to admit, I’ve now become quite fanatical over this mug craze. It’s truly revolutionary and completely puts to shame that old saying “the best thing since sliced bread”. Whenever you get a craving for a certain something, like with chocolate for example, you just place the ingredients into the confines of your favorite, microwavable mug then nuke it for a few minutes; et voila! Chocolate mug cake for one. I know some people like to downplay these mug inventions as simple student/college dorm room cuisine. But in my opinion I think age knows no bounds with this clever little life hack. Because there are literally hundreds upon hundreds of these little hacks over on the web, especially on Pinterest. There is an abundance of recipes for the savoury kind to, so it’s not all about the sweet stuff when it comes to mug innovations. And let’s not forget the sheer convenience of it all, which firmly outweighs all arguments against, if any at all. Still not convinced? Well imagine a Friday night where you’ve opted to stay in. You’re in your favourite Adidas pants with a night full of Netflix scheduled. You’re tucked away, feeling snug as a bug beneath your lush velvet throw, when suddenly those chocolate cravings strike. And there’s not a crumb nor flake of chocolate remaining under your roof. With no choice but to succumb you delve and scrummage through your pantry – even though it’s a lost cause, and soon start contemplating dashing out to the shops or calling on Uber Eats (use code eats-soniam2435ue for $10 off your first order) in haste. So what do you do? 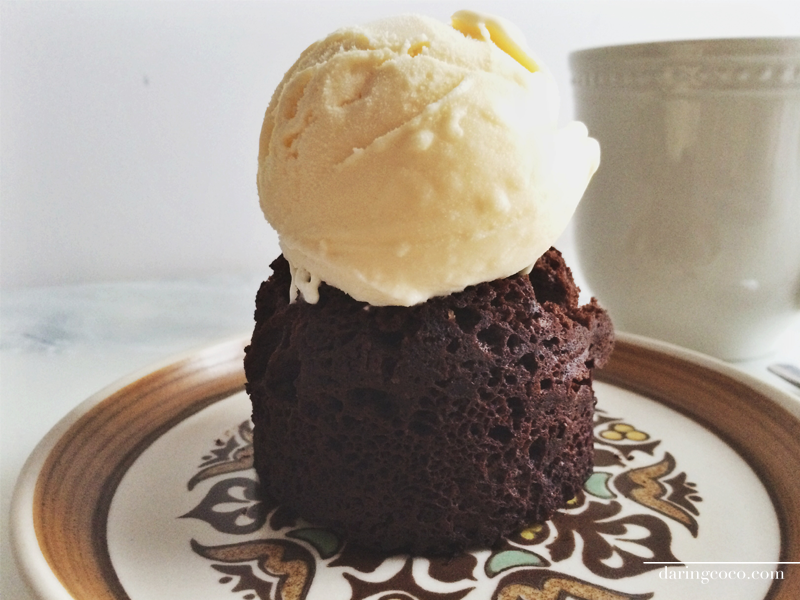 Bookmark this recipe for chocolate mug cake, that’s what. For those ‘incase of an emergency’ situations or for any day or time of the week really; I pass no judgements here. Place all ingredients into a microwavable mug and mix to thoroughly combine. Microwave on high for around 1-2 minutes depending on the strength of your microwave. 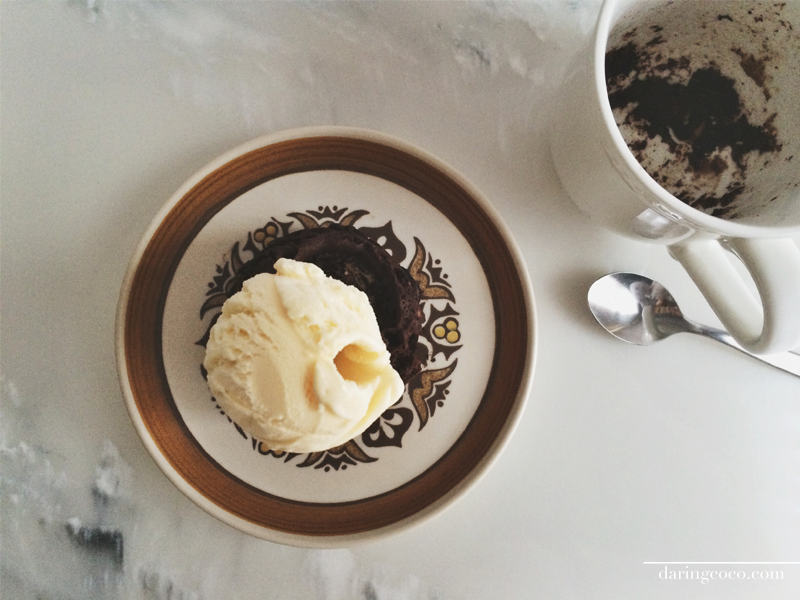 Serve inside mug or pop it easily onto a plate with a dollop of vanilla bean ice cream.